Varian Johnson on Varian Johnson: “I was born in the thriving metropolis of Florence, South Carolina; in the late seventies. I had always enjoyed writing, but I gravitated toward math and science in middle and high school. “While pursuing a B.S. in Civil Engineering at the University of Oklahoma, I started writing novels in my free time—not that I had much free time. “The first novel I ever completed sits safely in a file cabinet in my home office. The second full novel I completed, A Red Polka Dot In A World Full of Plaid (Genesis Press), was published in 2005. “A few months after I sold my second novel, My Life as a Rhombus (Flux/Llewellyn, 2008), I decided to go back to school to get my MFA in Creating Writing for Children and Young Adults from the Vermont College of Fine Arts. Read Varian’s blog, and visit him at MySpace! I was a voracious reader. Library visits were a big deal in my house–my brother and I would routinely fight over who would get to read certain books first. I remember being a big fan of Susan Cooper‘s The Dark is Rising Sequence (Simon Pulse, 2003). However, I found that the books that really resonated with me were Judy Blume‘s novels, especially Are You There God? It’s Me, Margaret (Yearling, 1986) and Starring Sally J. Freedman as Herself (Yearling, 1986). As I grew older, I actively sought out books featuring African-American teens. Two novels that I fondly remember are Virginia Hamilton‘s Sweet Whispers, Brother Rush (Amistad, 1983) and Walter Dean Myers‘s Motown and Didi (Laurel Leaf, 1987). What led to your decision to become a writer? Well, I had always enjoyed writing, but it wasn’t until college that I really tried to write something for publication. I had been a big fan of YA literature, but my work tended to waffle between YA and adult. Then I read Hard Love by Ellen Wittlinger (Simon & Schuster, 1999)(author interview), and I knew that YA was where I belonged. I wouldn’t be a YA author today if I hadn’t read that novel. Everything seems so immediate and fresh and awe-inspiring when you’re a teenager. The teen years are when most people are figuring out who and what they’re destined to be. It’s an age where the simplest things can cause the most spectacular results. I love trying to capture those key things that define who we are. Looking back at my own teen years, I clearly remember certain people and events that had profound effects on who I am today. The teen years really are a time of wonder and enlightenment. Sprints—no. Stumbles—yeah, a bunch. When I first tried to write, I didn’t know nearly enough about the craft or the industry, and what little research I did on becoming a writer was based mainly on adult publishing. I tried writing mysteries, literary fiction, and science fiction for about two years before I finally found my voice in contemporary teen fiction. Even then, my work teetered on the edge of YA and adult, mainly because at the time I had no idea what I was doing. After I graduated from college, I moved to Dallas, and got involved with a few local writing groups. More importantly, I joined SCBWI and attended my first local and national conferences. I worked on A Red Polka Dot for a few more years, and finally the manuscript landed me an agent. We sold the novel in 2002, but due to lags in the publication schedule, the novel wasn’t released until November 2005. I was happy with the novel, but in my heart, I knew that I didn’t belong in the adult publishing industry. So after careful consideration, I cut my ties with my agent and publisher, and went about writing a true YA novel. 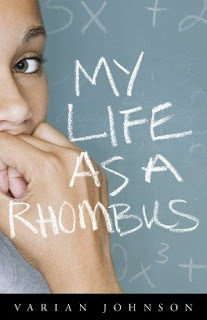 Congratulations on the publication of My Life As a Rhombus (Flux, 2008)! Could you fill us in on the story? When people ask me about the novel, I like to say that the novel is about friendship and forgiveness, but plot-wise, it’s about math tutor Rhonda Lee, and how through her friendship with Sarah and David Gamble, she slowly comes to terms with the abortion that her father encouraged her to have three years ago. Well, the novel was inspired by a lot of events, but the main premise of the novel was inspired by a friend that was mulling over the decision of whether or not to terminate her pregnancy. I wanted to be the best friend for her that I could, which meant I sometimes gave advice when it wasn’t warranted. Finally, she told me that there were just some problems that I couldn’t fix—this was her decision, and she would be the one that lived with the decision, not me. She reminded me that sometimes the best thing a friend could do was to just listen, which is exactly what I forced myself to do after that point. A few months later, I found myself thinking about my friend’s situation, and I started to wonder what would have happened if she were younger, and if someone had forced that decision on her. After a few weeks of loose plotting and daydreaming, I had the nuts and bolts of the novel that would become My Life as a Rhombus. Let’s see…I started the novel sometime in the summer of 2003. I had a great critique with Allyn Johnston (then with Harcourt, now with Simon & Schuster) at the 2003 SCBWI Summer Conference in LA. Based on her notes, I decided to re-write the entire novel. I got married in November 2003, and the day after I got back from my honeymoon, I started on a fresh manuscript. I had numerous obligations that delayed my work on the novel—I took four months off to prepare for my state licensing exam in civil engineering, then I took another few months off to prepare for the Fall 2005 release of my first novel. I’d say that I finally completed a serviceable manuscript in November 2005. I was really worried about getting the voice right, so in December 2005, I hired writing coach Esther Hershenhorn (author interview) to critique and edit the manuscript. In addition to making a lot of good suggestions, especially concerning plot issues and the incorporation of the “rhombus” theme in the manuscript, she gave me confidence and a much-needed shot in the arm. I finished editing the manuscript and started sending it out, and within six months, I had a new agent and a sale. For a long time, I struggled with whether or not I should tell this story. Finally, I decided that if I was going to do it, I was going to be as accurate as possible. I conducted phone interviews with women’s clinics, consulted state laws concerning abortion rights, and read as much as I could on both pro and anti-abortion positions. Sometimes I still worry if I got everything right, but so far, reaction to the novel has been pretty positive. Your previous novel, A Red Polka Dot in a World Full of Plaid (Genesis Press/Black Coral, 2005) was published for adults. Could you tell us about it? A Red Polka Dot In A World Full of Plaid is a coming-of-age story about a girl that finds out her father is alive, after believing that he was dead for most of her life. She rushes cross-country from her home in South Carolina to Oklahoma, where she finds a man that is nothing like she expected. However, she decides to stay in order to get to know him, and in the process, she learns a lot about herself and her view of the world. I would tell myself to calm down and to enjoy the ride. I would also encourage myself to really study the craft of writing. Lastly, I would encourage myself to surround myself with other writers that really understood writing for children and young adults. I work at an engineering firm where I design bridges and other transportation-related structures. If you live in Dallas or Austin, you’ve probably driven over one of the bridges that I designed. Seriously, I’ve yet to find a good balance between writing and everything else. When I’m really passionate about a novel in progress, I tend to ignore everything else about the business. When I’m stuck on a novel, I throw myself into promotion. So far, it seems to have worked out pretty well, but my goal for this year is to have a more organized plan—or rather, a plan in general—for juggling all of my writer responsibilities. Stephanie Lane at Delacorte just acquired my latest novel. It’s tentatively called The Path of the Righteous, and it’s a coming of age story about a preacher’s kid set in South Carolina. And this time, the main character is a boy!